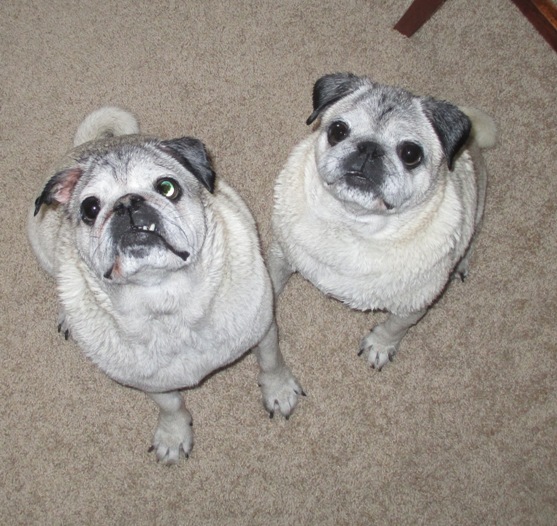 Foster home update – Zeus and Poseidon are a bonded pair of ten year old brothers. They love each others company as well as other critters they come to meet. They are crate trained and house broke, they love to sleep in their laundry baskets. They both need eye drops for pigmentation in the eyes but they don’t let that stop them. Zeus is hard of hearing but does good even so. They love being snuggled and having belly rubs. Zeus and Po are adopted and are having so much fun in their new home. They have adapted well to their new surroundings and have been such good boys at home. They are very smart and learned the habits of their new parents very quickly. They enjoy short walks on the nearby trail and bring smiles to every passerby they encounter. Here they are post bath and as you could probably tell are waiting for treats from Dad.